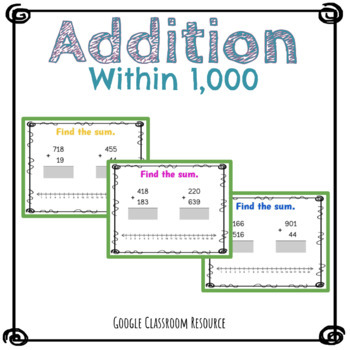 Looking for Google Classroom Ideas for Elementary? Imagine using your time to plan effective lessons instead of grading countless student papers! Using Google Classroom is the perfect solution! With this file you will be able to share assignments with your class through your Google Classroom without ever having to hand out any paper! Your students are sure to love interacting with each of the slides! DIGITAL RESOURCE: This is a Google Drive and Google Classroom resource. 30 three digit addition sentences featuring numbers between 0 and 1000.